You enjoy the potential that the open road provides. With the wind in your hair and the sun at your back, taking your motorcycle for a drive allows you to feel free. However, if you have been involved in a motorcycle accident, that freedom is taken from you as you suffer potentially life-altering injuries. 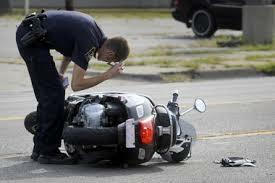 The very nature of a motorcycle accident is different from a car vs. car collision. From the depth-perception of the different vehicles to their abilities to react and the damage done, there is so much more involved with car vs. motorcycle collisions. That is why it is so important to have a personal injury lawyer with the experience and knowledge necessary to not only understand these differences, but to make them work in your favor. We are driven to get you the compensation you deserve, whether from an insurance company or a jury, so that you can begin to repair your life without the financial or emotional burden that has been placed on your shoulders. Call us today!